While the digital economy has operated in a relatively tether-free fashion to date, various scandals throughout the last 18 months have shown these companies are not mature or honest enough to manage themselves. Facebook has drawn the lion’s share of the headlines, but the social media giant is not alone in abusing the system; this is a pandemic with Silicon Valley as ground zero. “While online services like Facebook, Apple, Amazon, Netflix and Google bring undeniable social and economic benefits to Australians, they have now become global giants with significant market power in Australia,” said Nerida O’Loughlin, Chair of the Australian Communications and Media Authority (ACMA). The ACMA statement follows the Digital Platforms Inquiry Preliminary Report from the Australian Competition and Consumer Commission (ACCC) which calls for regulatory reform to tackle newly emerging segments of the digital economy, as well as greater powers to gain insight into how businesses such as Google and Facebook actually work. This has been the great conundrum of the last few years; these companies have incredible power and influence over society and business, though due to opaque transparency reports and sheer complexity, few understand the cogs of the digital machine. This is not a healthy position; these companies should not be allowed to operate in a cloud of confusion, such is the power they wield. It would be irresponsible of any government to allow such a dangerous status quo to continue. What this report suggests is the creation of a new set of rules, which would govern the digital economy as what it is. These companies are no-longer simply platforms, and they are not digital publishers. For years, regulators have tried to squeeze them into existing regulatory frameworks and it has not worked. The creation of new rules, fit for purpose to tackle the digital economy and specific to the companies which dominate it, are critical. As you can probably imagine, the internet giants are not particularly happy with this assault on their freedoms. Facebook has accused the ACCC of protecting traditional media titles at the expense of digital and the consumer, while Google has suggested the ACCC is ill-informed when it comes to basic understanding of the current state-of-affairs. The aggressive and patronising objections to the ACCC and ACMA should come as little surprise as the internet giants face greater controls on their businesses throughout the world. Australia and Europe seem to be the tip of the spear, but others will soon follow suit once they see how regulations can be effectively reformed. Unfortunately for the internet giants, there is not a single focal point. In Europe, certain states are putting stricter rules in place for the removal of offensive materials, Germany is leading the charge here. GDPR is a European-wide response to privacy concerns. The tax-avoidance schemes are being tackled by France and the UK. The Netherlands is tabling new rules which would made foreign acquisitions more difficult. The digital business model is being assaulted from numerous angles, and quite rightly so. Over the last decade, the internet giants have become experts at wriggling through the red-tape maze and exposing the regulatory grey areas. This is only possible because rules have not been designed specifically for the internet economy, an anomaly in today’s world. Every other industry has rules which are designed specifically for those circumstances, and the world is starting to wake up to the need for the same here. Arguments against might take the form of slowing progress, but the internet giants have not shown themselves responsible enough to self-regulate. Cambridge Analytica, overly-complex T&Cs, data breaches, insecure databases, irresponsible data processing and handling activities, hosting of offensive material and unauthorised location tracking scandals are just a few areas which need to be addressed. Regulators and legislators need to wake up and start governing the digital economy. Thankfully, Australia and Europe are taking the fight to Silicon Valley. The internet giants have started filing their lobbying reports with the Center for Responsive Politics with records being shattered all over the place. Each quarter US companies are legally required to disclose to Congress how much has been spend on political lobbying. Although the figures we are about to discuss are only for the US market, international players will certainly spend substantially more, it gives a good idea of the pressure which the internet players are facing. Governments are attempting to exert more control and Silicon Valley doesn’t like it. Looking at the filings, having spent $4.9 million in the final three months, Google managed to total $21.2 million across the whole of 2018, a new high for the firm. This compares to $18.3 million spent across 2017. Facebook is another which saw its lobby bill increase. In its latest filing, Facebook reported just over $3 million for Q4, and totalled almost $13 million across the year. In the Facebook case it should hardly be surprising to see a massive leap considering the scale and the depth of the Cambridge Analytica scandal which it has not been able to shake off. More filings will be due over the next couple of days, the deadline for the fourth quarter period was January 22, though the database search tool is awful. What is worth noting is this is set to be the biggest year for internet lobby spend, however it is still nothing compared to the vast swathes which are spend elsewhere. In total, the internet industry might have spent a whopping $68.7 million on lobbying Washington over 2017 (2018 data is still not complete), but that is nothing compared to more mature industries. 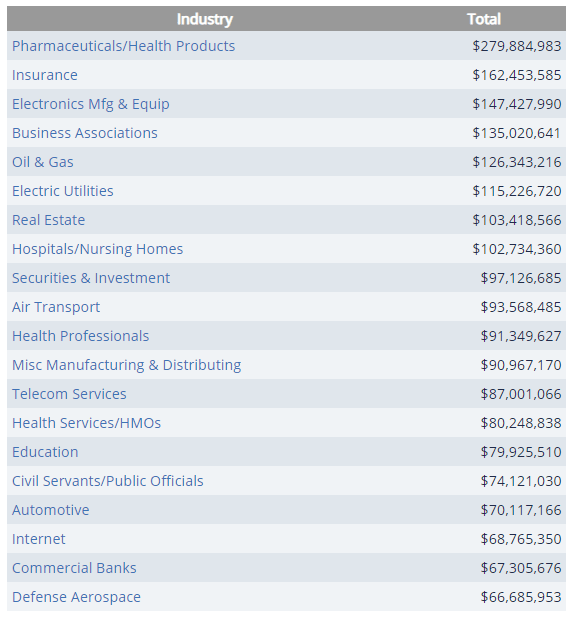 The Oil and Gas segment spent $126 million, while Insurance pumped $162 million into the lobbyists pockets, but the winner by a long was the pharmaceutical industry spending an eye-watering $279 million on lobbyists across the year (see image for full list). As you can see, the ceiling has been set very high for lobbying and it will almost certainly increase over the next couple of years. All around the world governments and regulators are attempting to exert more control over the internet industry, and while the lobbying process isn’t necessarily attempting to block these new rules, the aim will be to get the best deal possible. In comparison to other industries, the internet specifically and technology on the whole is relatively new. You have to take into account the internet as a mass market tool is only in its teen years and is demonstrating the same rebellious tendencies as young adults do. New ideas are being explored and boundaries are being pushed; with some breakthroughs rules do not exist, while the emergence of new business models means companies fall into the grey areas of regulation. The internet has been operating relatively untethered over the last few years, though this is changing. 2018 was a year where it all started to hit home. Countless data breaches demonstrated the digital world is one where security has not been nailed, while data privacy scandals have shown how dated some regulations are. It doesn’t help that Silicon Valley seems to operate behind a curtain which only the privileged few are allowed to peak behind, but even if this barrier was thrown open, only a small percentage of the world would actually understand what was going on or how to regulate it effectively. GDPR was a step in the right direction in handing control of personal information back to the user, but this only applies to European citizens. Other countries, such as India, are learning from these regulations with the ambition of creating their own, but it is still very early days. The rules and regulations of the digital economy are being shaped and the internet giants will certainly want to influence proceedings to ensure they can still continue to hoover up profits in the manner which they have become accustomed to. Looking at where money has been spent, data privacy and security concerns is a common theme with all the internet players who want to protect their standing in the sharing economy, though mobile location privacy issues is another shared concern. With data getting cheaper, more people will be connected all the time, opening the door for more location-based services and data collection. This could be big business for the internet giants, though it has been targeted by privacy advocates looking to curb the influence of Silicon Valley. Other issues have included tax reforms, antitrust and artificial intelligence. So yes, a remarkable amount of cash is being spent by the likes of Google and Facebook at the moment, but this will only grow in time as regulators and legislators become more familiar with the business of the internet and, more importantly, how to govern it.